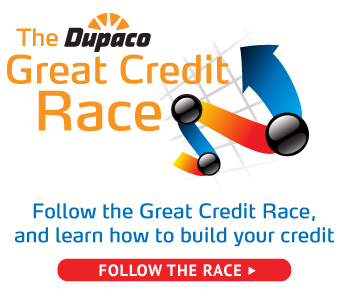 As racers near the Great Credit Race finish line, the battle to build solid credit remains a three-way tie. Anna O., Kiernan S. and Brett B. have long been leading the race, now tied with credit scores of 705. Four Dupaco race coaches have been guiding the competitors for the past five-plus months—and they’re ready to watch someone break away for the win. With the race nearly over, the coaches share what they’ve gleaned from the competition so far. Apart from a few racers who have experienced big gains or drops, most credit scores haven’t moved significantly, says race coach Amanda Durham. “I thought there would be more changes,” she says. Race coach Ben Strautmann agrees. Race coach Tonya McGlaughlin had predicted that an installment loan would be a game-changing play for one of her racers. While Dupaco’s Credit Coach Loan will pay off for her racer in the long run—and help her get approved for a personal loan—it has not given her a leading edge during the race. “Even though she’s done everything right and has done a great job keeping her credit card balance super low, it’s keeping her score down by having those two lines of credit out there,” she says. So, what’s been the secret credit-building sauce? The leading racers are using their Dupaco Platinum Visa credit cards for small purchases and paying off their balances immediately—not even waiting for their statements to arrive. Racers have fared better by keeping things simple with a single credit card. One of Durham’s racers opened a Credit Coach Loan, while another took out a personal loan. For Henriksen, it has come down to communication. Those racers who have been willing to heed the credit-building advice of their coaches have fared better, she says. “I think the people who really want the help and want to know and grow are going to ask the questions to make sure they are doing things right,” she says. McGlaughlin is hoping to change the momentum of the race by having her racers take a new approach. Another factor that could impact racers at the very end: student loans will begin showing up on some racers’ credit reports. “That’s probably going to separate the racers,” Strautmann says.